The legendary surf breaks at Echo Beach and Batu Bolong Beach. If you’re looking for an exotic vacation then a trip to Bali can make your dreams come true. From its long stretches of picturesque beaches to its sprawling marketplaces, and an abundance of outdoor activities for the whole family, Bali offers something for everyone. When planning a vacation to Bali, Canggu is the one place that often comes to mind. Canggu is a resort village on the southern coast of Bali, ‘The Last Paradise’. This coastal village lies between Tanah Lot and Seminyak, two other popular tourist destinations in Bali. Canggu is definitely a hot-spot on this picturesque Indonesian island paradise. The area is known for its scenic beauty and laidback vibes, that makes it the go-to destination for many holiday makers from around the world. Explore this majestic land, smoking volcanoes, tropical vegetation and idyllic beaches. Enjoy the bustle of Asian city life, impressive temples and palaces, traditional dances and music and, above all, the warm, friendly, colorful locals, and delicious, traditional cuisine. Don’t miss the “Island of gods and demons”, with its unique culture and beautiful landscape.While there are other tourist destination around the area, Canggu beach is where tourists go to experience the “real Bali”. Our central Canggu location enables you to experience the real Bali, enjoy the nature and serves an ideal starting point for your tours. If you’re wondering about a place to stay then an accommodation in Canggu villa offers a modern, tropical style accommodation, situated in a secluded area of 5000 m2 and surrounded by a few neighboring villas and pretty rice fields. From your balcony, you can watch the local farmers harvesting their rice paddies. People often refer to our accommodation as a romantic place and kids/family friendly private retreat. The convenient location of Yoma Villas Bali private accommodation enables you to experience the Balinese lifestyle, local people and enjoy quiet surroundings. People that were looking for accommodation in the famous Kuta or Seminyak areas are often surprised when they come to us. We are very close to Seminyak, the location is much quieter though. You can see more of local Balinese lifestyle and culture when staying in Canggu. 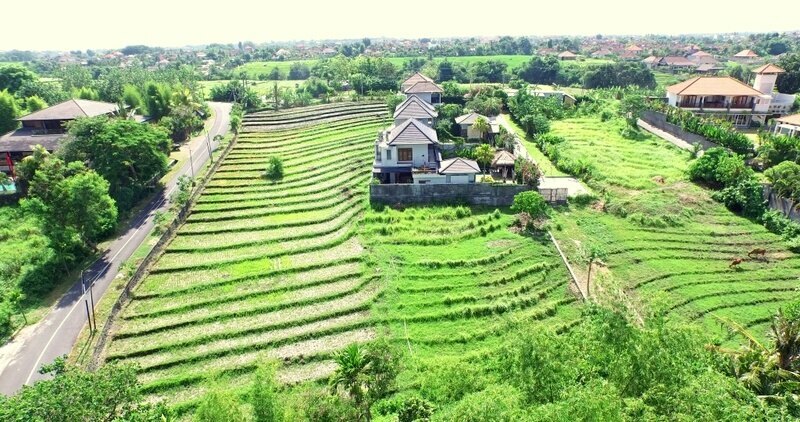 Yes, its perfect location of our villas in Canggu that enables you to explore all the attractions and beautiful places. Learn more about getting around. Many people think Bali is overcrowded and too commercial. However, real Bali is still peaceful with friendly people, beautiful spots that wait for you to be discovered, rice fields to admire and Balinese vegetation that is so different to European, American or Australian flora. When you walk from our villa, you will find yourself directly in the middle of rice fields and narrow roads can lead you to local streets of Canggu, where you can see real people and experience the real Balinese life. Local people selling fresh fruit, vegetables, smoked tunas, Bakso carts, small warungs to enjoy nasi campur, nasi goreng, mi goreng, tempeh and so much more. In Pererenan, Canggu, you are in the middle of paradise (we have a video about our Canggu villas on our homepage). The legendary surf breaks at Echo beach are only a few minutes away from Yoma Villas Bali and there is a wide range of restaurants available. You can mingle with the locals, trying one of the numerous “Warungs”, with its typical Indonesian dishes, or you decide to dine in one of the elegant upper-class restaurants – there is something for everybody! Anakan Megantung is considered to be one of the wonders of nature. It is a place where holy water springs from a naturally occurred hole in the rocks. Anakan Megantung is located directly beneath the Tiga Taman temple. The fountain of holy water is used in religious ceremonies and is one of the unique places in Bali. Tourists can take part in horse riding through the lush green rise fields at Pererenan. Horse riding has become one of the main attractions during trip to Bali. Tanah Lot is one of the most iconic sites in the whole of Bali. It is an ancient Hindu temple that sits perched atop a rock. Pura Tanah Lot means ‘Land in the sea’. Since its one of the main attractions on the island, expect to see lots of tourists. Canggu Village is a great place to learn how to surf. There are many surf schools around and it’s a popular pastime for tourists and locals alike. If you already know how to surf then all you have to do is head on down to the beach to enjoy the magnificent waves at Canggu Beach. 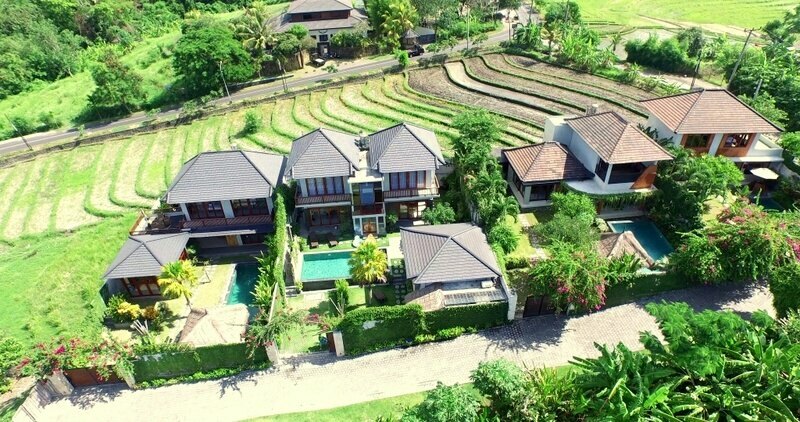 A Canggu luxury villa is known for the unique culinary experience it offers its visitors. From vegan restaurants to smoothie bowl places, and the traditional restaurants that serve fish and meat delicacies, expect to find every type of cuisine to whet your appetite right here. Yes. That’s right. Canggu also offers the 18-hole Nirvana Golf Course, where tourists get to relax and enjoy the weather as they play golf on a lush green field. If you love to party then you are not going to be disappointed with your visit to Canggu. While there’s plenty to do while the sun is still shining at Canggu, once the sun goes, there are plenty of parties around the area, where you will meet everyone from surfers to backpackers and families who are all vacationing at Canggu. Within a 10-minute drive from Canggu, you are at the famous sunset temple Tanah Lot and Nirvana Golf course. Within a 20-minute drive, you can enjoy the nightlife, trendy shops and restaurants of Seminyak. The airport is a 40-minute drive away from Yoma Villas Bali. On request, we will organise the rental of a scooter, motorbike, car or a car with your own driver. Of course, you can also use the local taxis, which are very affordable. Our villas are located in the village of Pererenan, which is surrounded by the Padang Linjong street at its east border.Pererenan is located on Mengwi Sub district, Badung Regency and Bali Province, just 40 minutes away from the Denpasar Airport. The treasures you will find at Pererenan Village includes, the green rice fields, Anakan Megantung and the Pererenan beach. If you love lush green landscapes, then you are going to love the rice fields at Pererenan. We will take care of your transport from the Denpasar airport, so you can relax and let us deliver you directly in front of your villa. Depending on the traffic, the ride should take 40 minutes or more. The most preferred way of getting around while on the island is by hiring a car with driver. From Pantai Pandawa it should take you about half an hour, if you go directly from Yoma Villas, the trip can take 1.5 hrs. The best part is, that the airport is a 40-minute drive away from Yoma Villas Bali. On request, we will organize the rental of a scooter, motorbike, car or a car with your own driver. Of course, you can also use the local taxis, which are very affordable. There are plenty of accommodation options in Canggu, from the typical apartments to luxury villas. If you are looking for a Canggu villa with pool, Yoma Villas Bali is the right choice for you. Our villas are in Balinese style, which sets it apart from the rest. The exquisite wood décor and open-air layout of the villas are what makes them most desirable to tourists. The staff is amazing, friendly and helpful. The rooms are spacious with everything you could possibly need to make your stay comfortable. The garden is large and well maintained with a fantastic pool and gazebo. Amazing location of our villas in Canggu and incredible food delivered to the villa.